Click here for a zoomable map of Trammel's Trace in Marion County from the Texas General Land Office. 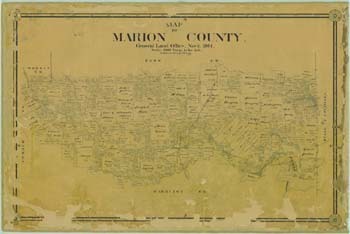 The route of Trammel's Trace across Marion County is well documented in the original headright surveys compared to some of the other counties. The route southwest of Jefferson was fairly well marked, but it crosses some serious bottom land amidst the Big Cypress and Little Cypress Bayous.